Dr. Navid Baradarian can perform a pocket reduction surgery at his New York, NY, dental practice to remove disease-causing bacteria in order to prevent future bone and tissue loss. This procedure is often recommended for patients with moderate to advanced stages of gum disease, also known as periodontal disease. Gum disease is a chronic infection in the soft and hard tissues of the mouth that—when left untreated—can create pockets in the gums filled with bacteria. When this happens, tooth loss, jawbone degeneration, and even serious physical health conditions can occur. Dr. Baradarian uses the latest techniques to ensure our patients receive the best periodontal treatment available. Pocket reduction surgery, also known as flap surgery, is a type of gum disease treatment intended to remove bacteria and plaque buildup deep below the gums and root surface of the tooth. As gum disease advances, deep pockets can form between the base of the tooth and gums, eventually leading to soft and hard tissue deterioration and tooth loss. Pocket reduction therapy is recommended for patients with gum pockets too deep to clean effectively at home with regular dental hygiene and too severe for scaling and root planing to be effective. Undergoing this procedure can help the gum tissue reattach to healthy bone and prevent further bacteria from getting trapped below the gums. Dr. Baradarian will always strive to preserve your natural teeth, but in severe cases, he will perform an extraction to help maintain good oral health and prevent further damage from occurring. 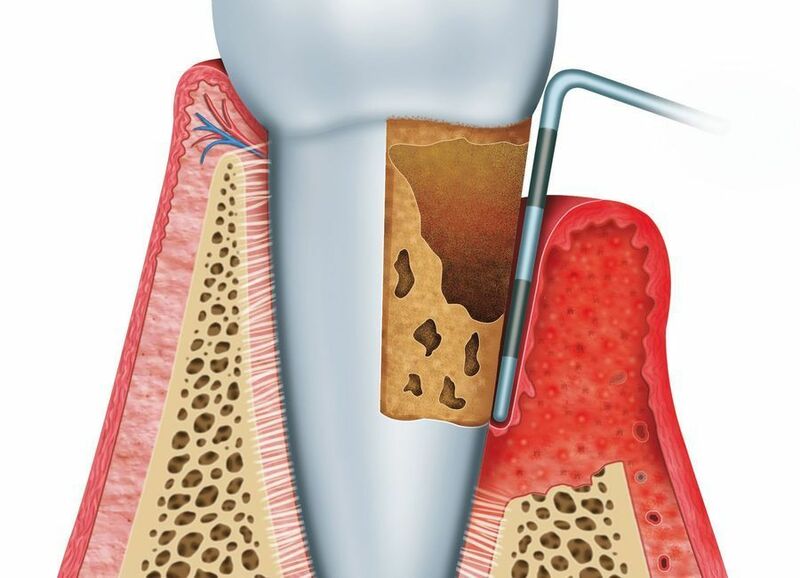 Pocket reduction surgery is an effective method for removing unhealthy bacteria and protecting long-term oral health. Before the procedure, Dr. Baradarian will perform a detailed examination of your teeth, gums, and jawbone using advanced x-ray technology to determine the extent of damage. He will also review your past and current medical history to ensure you are a good candidate for this procedure. Once a treatment plan has been established, you can schedule an appointment to have the procedure performed. On the day of the surgery, Dr. Baradarian can administer anesthesia for optimal comfort. Once your gums and the surrounding tissue are numb and you are comfortable, he will make an incision in your gum line to access the infected tissue. The gum tissue will be gently folded back so Dr. Baradarian can remove the unhealthy bacteria below the gum line. In some cases, he will use special dental instruments to smooth the root surface of the tooth to prevent pockets from developing again in the future. "Pocket reduction surgery is an effective method for removing unhealthy bacteria and protecting long-term oral health." Once the unhealthy tissue has been removed and the root surface effectively smoothed, he will fold the flap of gum tissue back over the base of the tooth and secure it in place with sutures. Depending on the extent of damage, the procedure can generally be completed in approximately one hour. The recovery process for pocket reduction surgery generally takes about two to three weeks, but most patients are able to return to work the following day. Following surgery, you may experience some swelling and soreness, but following your postsurgical instructions carefully and taking prescribed medications or an over-the-counter pain medication as directed can help you minimize discomfort. We also recommend keeping the area clean without disturbing the surgical site and avoiding spicy foods or foods that could cause irritation. To prevent any further infection from developing, it is important to maintain an effective daily dental hygiene routine. Dr. Baradarian or a knowledgeable member of our staff can instruct you on proper brushing and flossing techniques. Finally, it is important to your overall oral health to make and keep appointments for biannual cleanings and exams.